Are you sometimes embarrassed by your smile? Do you dream of a whiter, brighter smile? 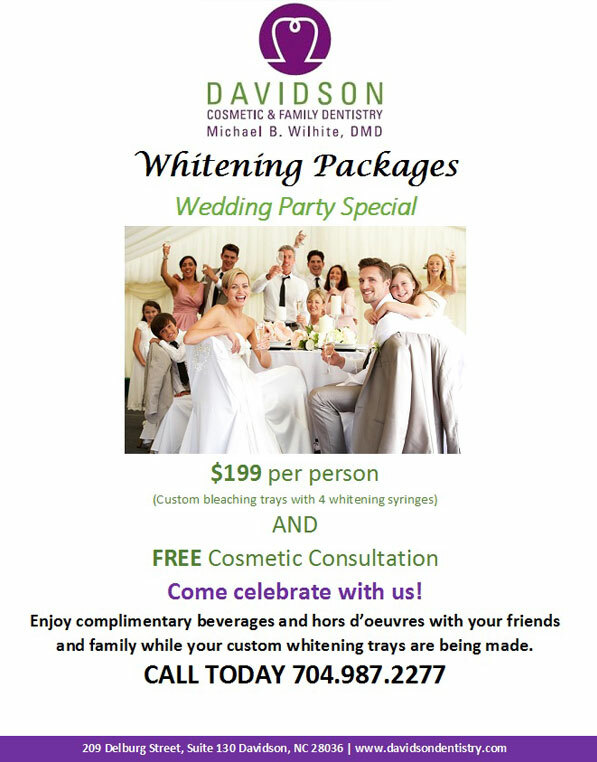 Ask Dr. Michael B. Wilhite about teeth whitening in Davidson, North Carolina! Our office provides in-office whitening as well as take-home kits. Dr. Michael B. Wilhite will help you determine which option is right for you. In-office whitening is the quickest way to whiten teeth. During this process, our dentist and team apply the whitening solution directly to your teeth. The solution is enhanced with the use of heat, a special light, or a laser. Results can be seen in just one 30- to 60-minute treatment. However, several appointments are usually needed to achieve the desired results. Take-home whitening kits use a tray and a gel whitening solution. The tray will be custom fitted to your mouth. Wear the tray as prescribed by Dr. Michael B. Wilhite; usually, the tray is worn for several hours a day or at night for up to four weeks. After desired results are reached, you can do touch-up bleaching on a monthly basis. Bleaching will not whiten porcelain crowns or composite tooth-colored bonding or fillings. It is an excellent choice to bleach your teeth before restorative or cosmetic work is done on front teeth to achieve the most beautiful result possible. Please call Davidson Cosmetic & Family Dentistry for more information and to schedule a consultation.